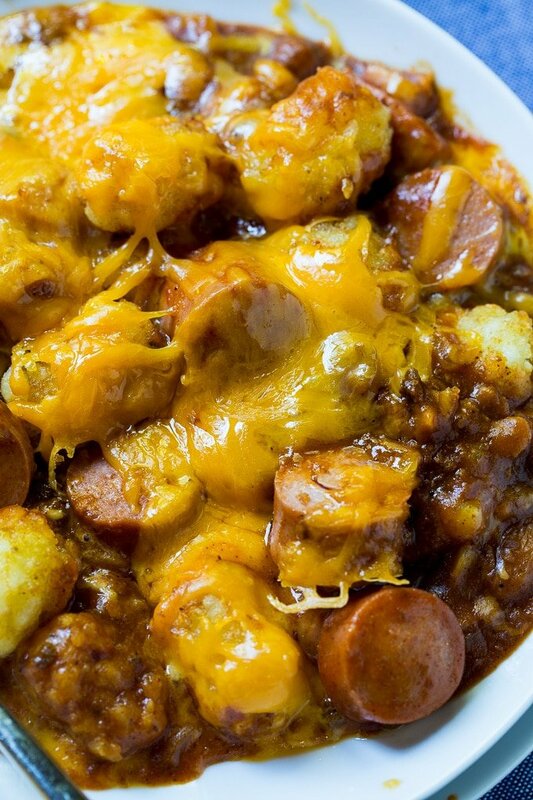 Cheesy Hot Dog Tater Tot Casserole is pure comfort food. 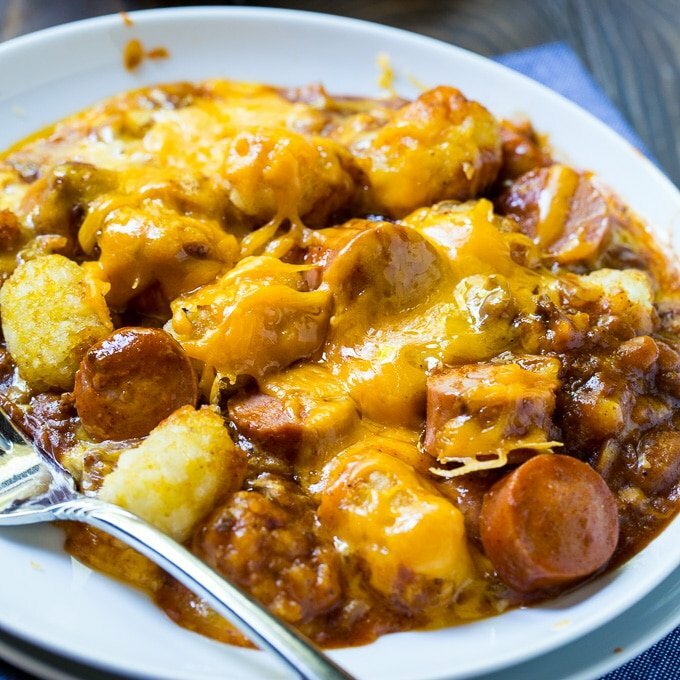 Sliced hot dogs, chili, tater tots, and cheddar cheese combine to make an easy and delicious meal. 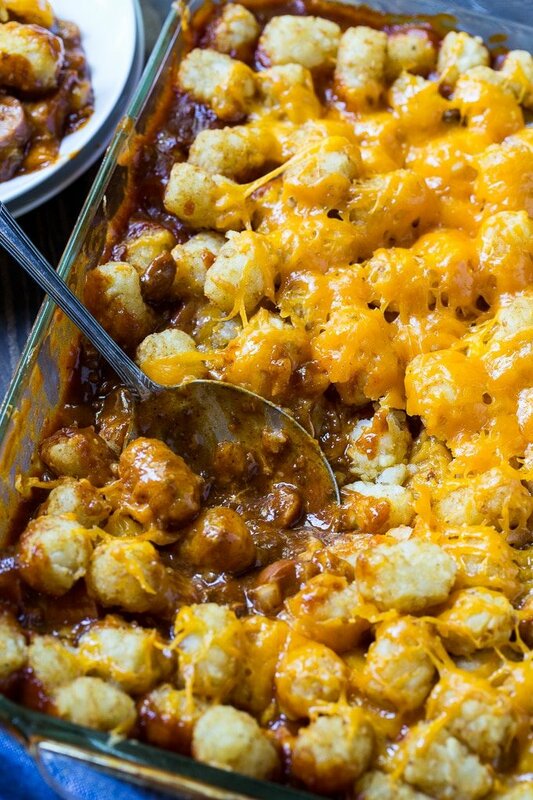 This redneck casserole is sure to be a family favorite. 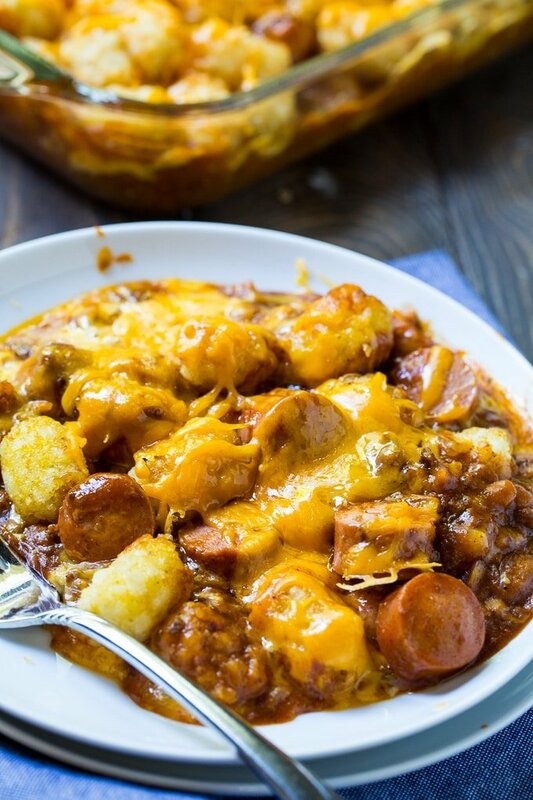 I use canned chili for this Cheesy Hot Dog Tater Tot Casserole but you could use homemade. Either with or without beans. You’ll need 2 15-ounce cans which would be just under 4 cups of homemade chili. I typically use one can with beans and one can without. Eight hot dogs get sliced and added to the chili along with ketchup, Worcestershire sauce, finely chopped onion, and just a few red pepper flakes. 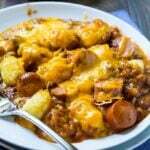 Place the mixture in a 9×13-inch baking dish and sprinkle with 1 1/2 cups shredded cheddar cheese. Then top with the tater tots. Bake for 30 minutes to get the tater tots crispy. Then sprinkle another cup of shredded cheese on top and bake 10 more minutes. Then get ready to dig into all that cheese! Be sure to either finely chop the onion or saute it for a few minutes. Otherwise it will taste raw and crunchy in the finished casserole. Sprinkle 1 1/2 cups cheese on top. 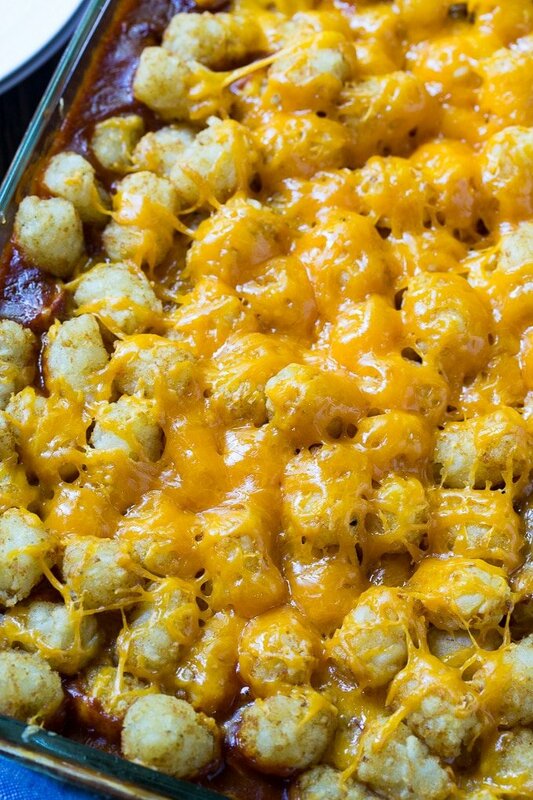 Spread tater tots on top of cheese layer. Sprinkle remaining 1 cup cheese on top and bake another 10 minutes. This entry was posted in Casseroles and tagged hot dogs, tater tots. Bookmark the permalink. Made it for a pot luck at church. Big hit. I used tomatoe sauce instead of catsup. I have made a really fabulously yummy chicken, bacon, tater tots recipe in my crock pot and the tater tots are cooked just fine. Could this recipe work in a crockpot? Probably wouldn’t cook the tots thoroughly. I use my crockpot a lot, but the tots would be mushy if cooked. I have made a really fabulously yummy chicken, bacon, tater tots recipe in my crock pot and the tater tots arecooked just fine.